I am 5 days post-surgery and things have been pretty good for the most part. I stopped taking the strong pain medications since they were giving me a bad headache. I switched to Aleve for 2 days, but have really not needed to take much in the way of medication. My first few days have been pretty boring, admittedly. The surgeon does not really recommend PT, so I’ve been doing a lot of laying around. I am very surprised that my hip and leg are not more swollen. I can see a bit of swelling, but the two legs look very similar. 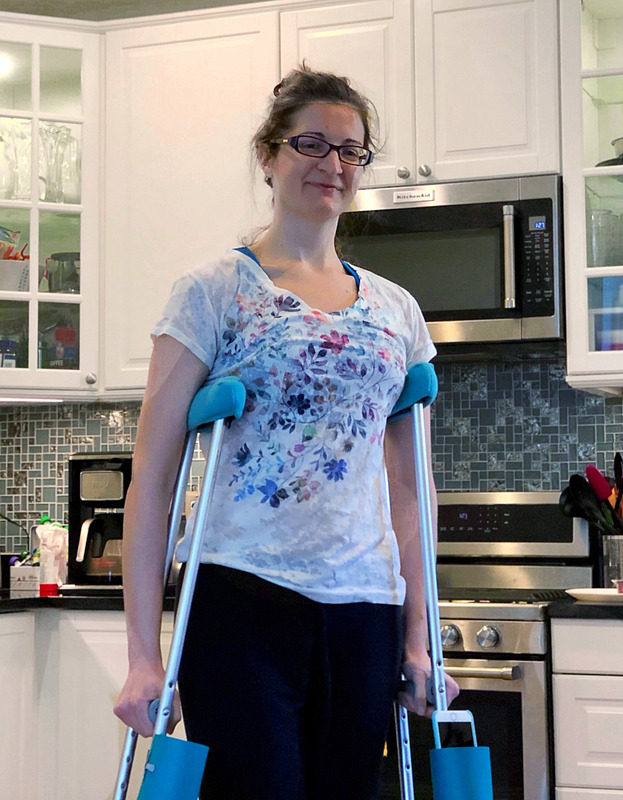 I’ve been icing regularly, and using two crutches to get around the house. One of the hardest things about crutches is that I can’t carry anything with me. I have a little trail of flat surfaces from the kitchen to the sofa bed that I use to transport drinks and food. Ken has been a huge help with my care and taking care of the house and pets, but it is nice to be able to get my own food. I was allowed to shower yesterday, so we took the gauze off my incisions (I have 5), covered them with waterproof bandaids, and verrrrry slowly used the crutches to get into the shower. I tried to make it as quick as possible since my other leg was getting tired from supporting most of my weight. To step into the bath tub, I put in the crutch from my good side, stepped in the tub with my good leg, very slowly raised my heel back, and into the tub. I used the crutches to turn around and position myself under the nozzle. Only then did I abandon the crutches and turn the water on. The way out of the tub was a reverse process, but even more careful since the tub was wet. Since our main bathroom is downstairs, I had to walk down 12 steps and then back up. To be honest, it was exhausting. I also tried to walk outside for a bit. I made it for about 5 minutes before getting really tired and shaky. Here’s hoping things get better a little bit every day.